In 2013 I began the process of simplifying my life. 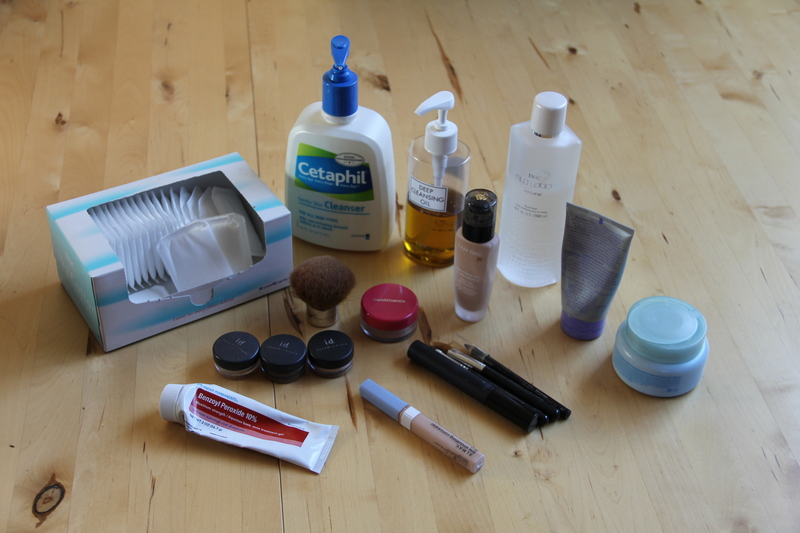 In February of that year, I took on the goal of de-cluttering my bathroom and finding ways to simplify my beauty routine. During the past year I have focused on more ways to simplify my beauty routine when possible, while picking products that are kind to the planet, kind to animals, kind to my pocketbook and most of all kind to my own skin and body! DEODORANT Before on left is my old deodorant, Dove Clinical Protection anti-perspirant/deodorant. Dove does animal testing, the plastic container is not recyclable and I can’t pronounce most of the ingredients. After on right is Schmidt’s Deodorant in Bergamot-Lime. They don’t do animal testing, all of the ingredients sound like those I’d find in my kitchen and it comes in a glass container which is recyclable. The Schmidt’s lid is plastic, but the jar is re-usable. And most important of all is that it works great, while also being gentle on my skin! One tip I learned from the Portland Vegans Facebook Group is to put the pea size amount of deodorant under your pit, do a simple task that doesn’t require you to raise your arms (such as brushing your teeth), then massage the deodorant into your skin. This allows it to soften and blend more readily. 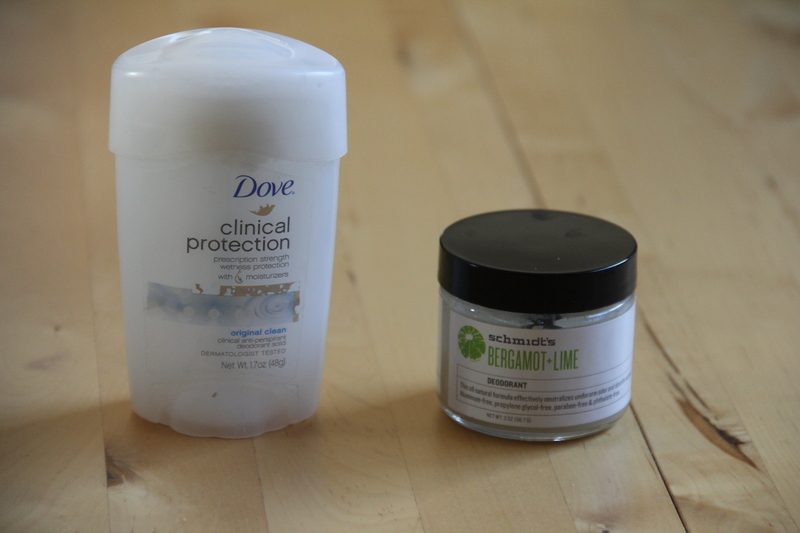 You can also make your own deodorant and that might be my next experiment to try! The price is about $2 less for the Schmidt’s than the Dove, with each container lasting me about 2 months. Deodorant – Before on left, after on right. LIPS Before on left are 2 products I used; Aveda lip shine and Forever Living lip balm. Both come in plastic that is not recyclable. Neither company does animal testing. The lip balm has beeswax and lots of chemicals in it. 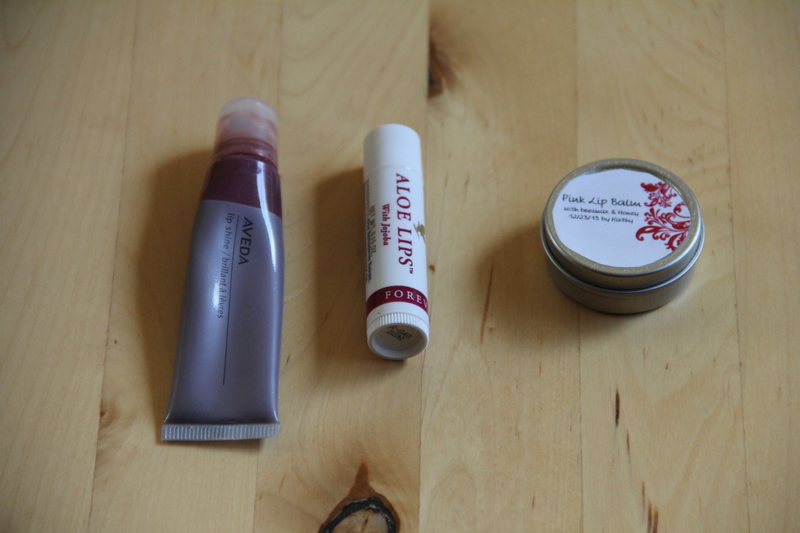 After on right is a homemade lip balm with tint, so now I am getting a simpler, 2 in 1 product. Ingredients are items from my kitchen and an herb store, no animal testing and it’s in a re-usable/recyclable tin. It takes about 10 minutes to make your own lip balm and even my first batch was about $3 a tin as compared to Aveda at $16 a tube. I feel proud and pleased to pull out my lip balm tin and use it, knowing it was made with love using healthy edible ingredients. It also feels great and my lips love it! Lips – Before is 2 items on left, after on right. ORAL CARE Before care for my teeth and mouth is below. Note: the 3 dental flosses are meant to simulate that I had lots of floss of various kinds, but unfortunately, I rarely flossed. (Sometimes when I have simplified, I got rid of things and so that is why I am “simulating” them in photos). For toothpaste, even brands like Arm & Hammer (which sounds so wholesome) have quite a few chemicals in them (PEG-8, PEG/PPG116/66 copolymer, sodium carbonate peroxide, tetrasodium pyrophosphate, silica, sodium saccharin, flavor, sodium lauryl sulfate, sodium lauroyl carcosinate to name a few). Check your own toothpaste to see what’s in it. I also learned that Arm & Hammer does animal testing. I used about 5-6 big tubes of toothpaste a year, so that along with the toothbrush was generating plastic waste that is not recyclable. I am now using Uncle Harry’s Natural Products tooth powder made of natural ingredients. It is vegan and it comes in a glass jar with plastic lid. It lasts almost one year as it has no water in it, making it light for travel. It is a little less foamy and sweet, so it did take a week or two to get used to, but it cleans well and leaves my mouth feeling fresh. 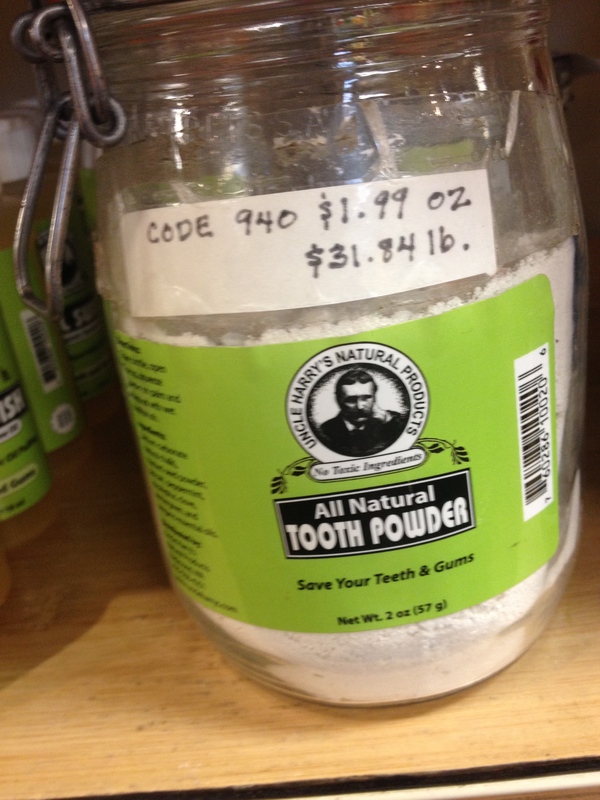 I found Uncle Harry’s tooth powder in the bulk bins at People’s Food Co-op here in Portland, so I can save even more money while not generating any packaging. In bulk the cost is $3 to $6 a year versus $20 to $24 for my old toothpaste. I periodically use coconut oil with baking soda as a toothpaste and I do oil pulling which is great for oral health. I am happy to say I finally found a good dental floss. I love dr. Tung’s Smart Floss and because I love it, I actually use it! It stretches to fit around your teeth better than any other floss I have used. It also comes in a biodegradable container. It is made with vegetable wax and beeswax, so unfortunately it is not vegan. I have written the company to ask them to consider making a vegan option. All of the dental floss that I am aware of, is not able to be recycled after use, so it goes into the trash. 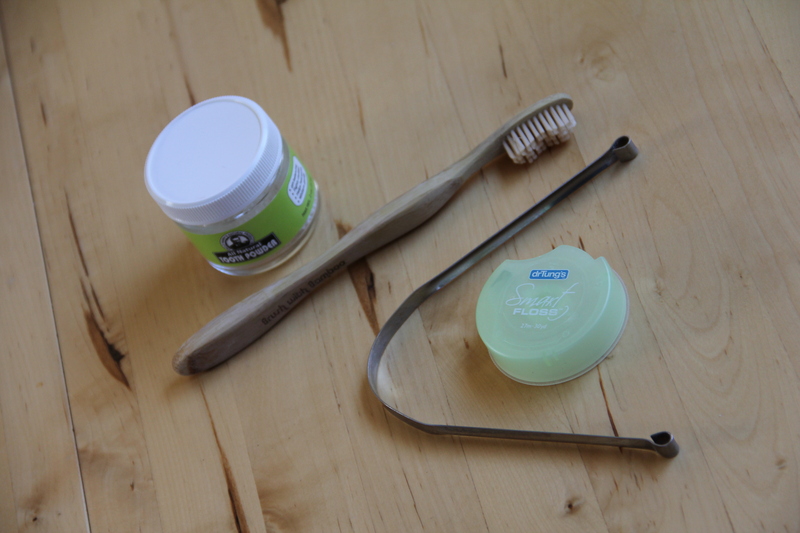 I now use a bamboo toothbrush that is 100% recyclable and I am still using my tongue scraper which is a great tool for good oral health. 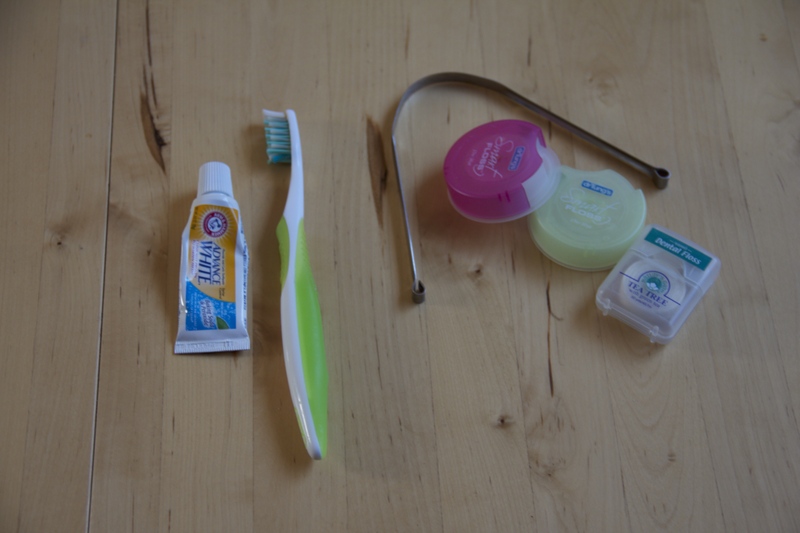 Bottom line on oral care – I was able to ditch the chemicals, save some money, reduce packaging and the only thing that is trash now is the floss! 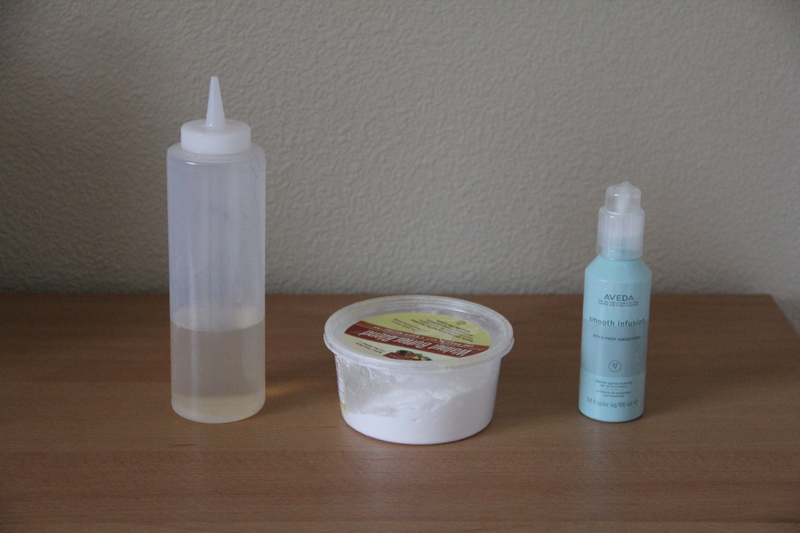 SKIN CARE & MAKE-UP Before for skin care and daily make-up, I cleansed with Cetaphil or DHC Deep Clean, then used DHC Mild Lotion toning lotion with a cotton pad. Here I am simulating Day Wear moisturizer and DHC facial scrub along with Benzol Peroxide and foundation, cover-up stick, blush, 3 eye shadows, eyeliner and mascara worn daily. Most is in plastic and cannot be recycled. It’s amazing when you think about Cetaphil’s advertising as being a product used for newborn baths and then you look at the list of ingredients! Even the Cetaphil Gentle Skin Cleanser recommended by Good Housekeeping has cetyl alcohol, propylene glycol, sodium lauryl sulfate, stearyl alcohol, methylparaben, propylparaben and butylparaben. Now is that something you really want on your newborn baby or your own skin? Skin care & Make-up before photo was complex and generated a fair amount of plastic waste while coating my skin in chemicals. After (below) shows my simplified daily skin care. 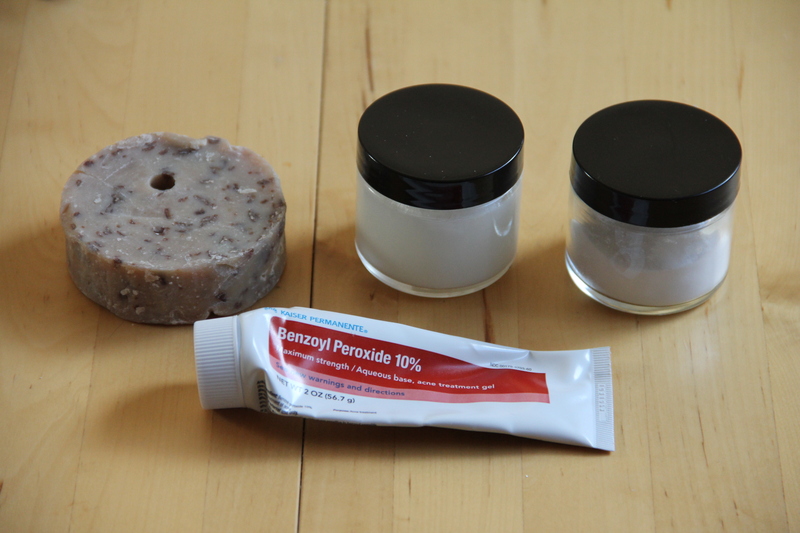 I wash in AM with Sappo Hill vegan soap (far left), then moisturize with coconut oil AM & PM (center) and apply benzol peroxide at night (bottom). I tried to get off the benzol peroxide while I was on the Camino, but even then I had breakouts. I am now on my second attempt to wean myself off it, as I really want to ditch the harsh chemicals. The soap comes as shown with no packaging and is just $0.79 each. The coconut oil comes in a large glass jar with a metal lid and I transfer it into the small glass jar at about $1 as compared to $35 for my past moisturizer. The baking soda I buy in bulk, so there is no packaging and it costs just $1.39 a pound. I use baking soda (right) with coconut oil as my new facial scrub and it works great with no plastic micro beads sent out to sea. Skin care after photo is simpler, more natural and costs significantly less. 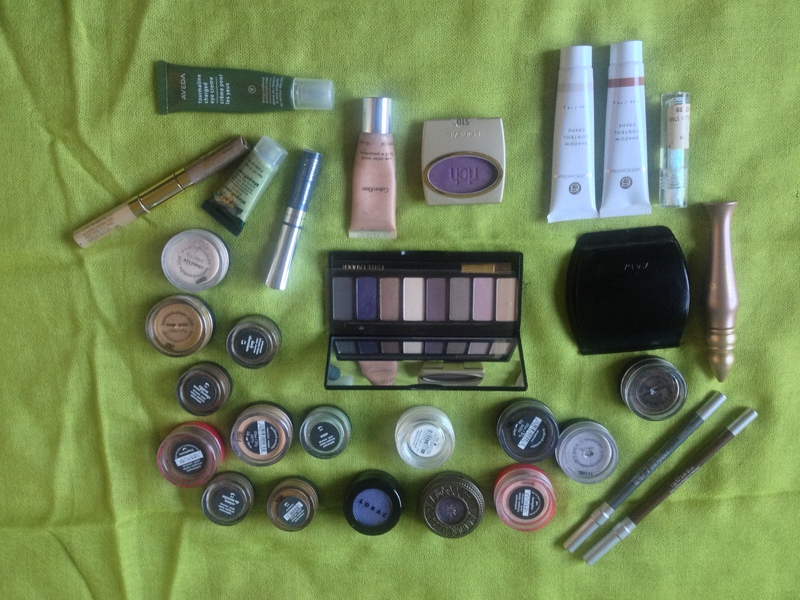 Last year it was a big deal for me to do a one week experiment with no makeup. What I learned is most people didn’t notice when I go make-up free and it is kinder on my skin. 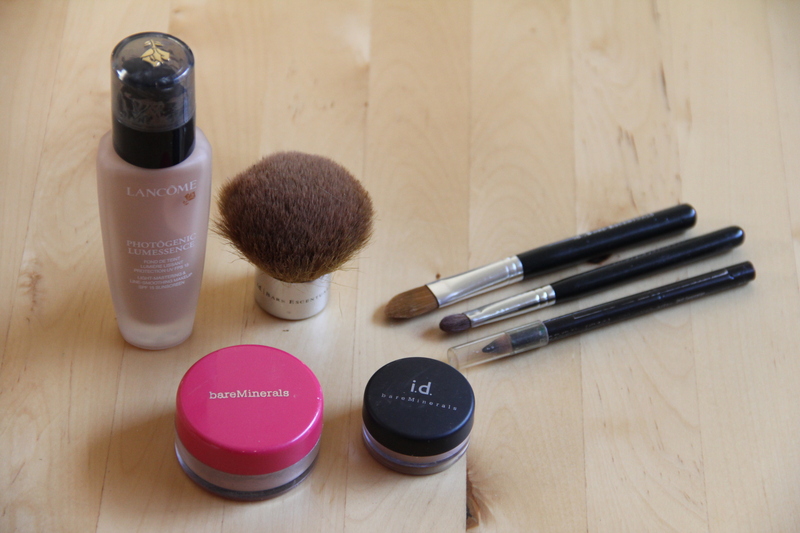 So now I wear make-up a few times a week versus daily. 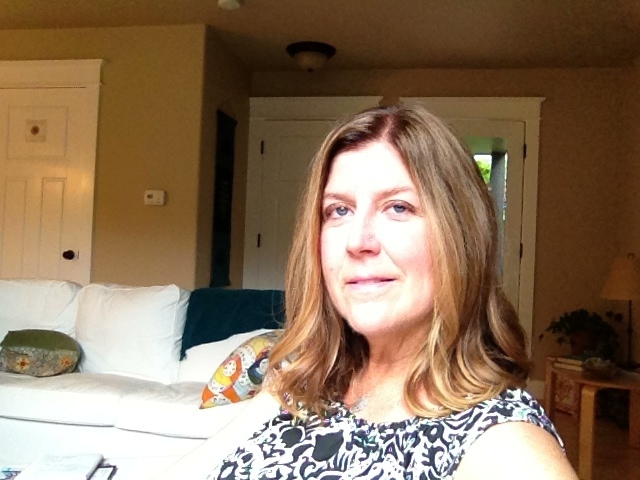 On “dress-up days” where I put on some make-up I have simplified by forgoing the cover-up and using less eye shadow. For right now I am using up what I have while researching better choices for my next purchase. Pacifica is a brand that is 100% vegan that will be worth checking out. So my make-up is used less often, adjusted for the day and look I want (i.e. lips and eyeliner one day, mascara and blush another), I am using less eye shadow in general and it’s a rare day when I wear foundation. Dress-up days make-up is simpler, but still needs more exploration on healthy options for earth, animals and skin. 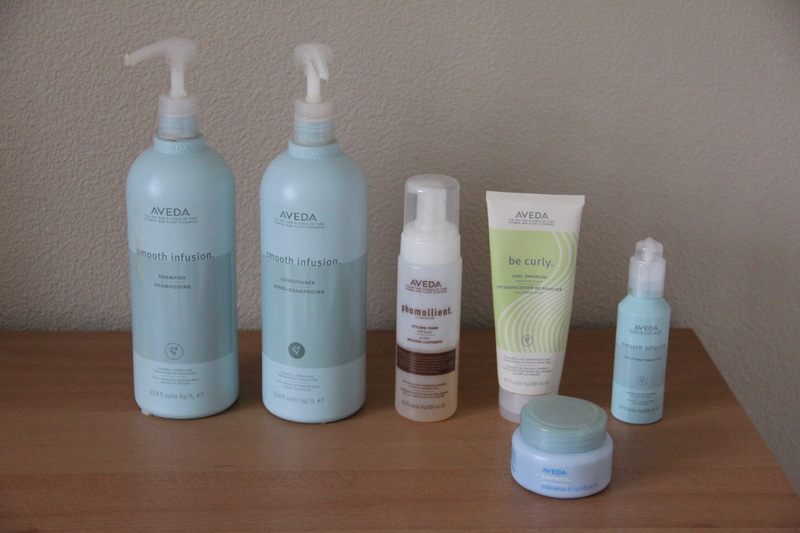 HAIR CARE Before I used a nice group of Aveda products including their Smooth Infusion Shampoo, Conditioner and Pre-Style along with Phomollient and Light Elements Defining Whip. And sometimes I used Aveda’s Be Curly Curl Enhancer. Again, my eyes were opened when I read the labels with a long list of ingredients that are difficult to pronounce. Aveda does not test on animals per the PETA website. My after hair care routine is now much simpler, much less expensive and you would never know that I use baking soda to “shampoo” and a dilute apple cider vinegar as the “conditioner.” This method of hair care has been named “No Poo” and even though the name is a bit off-putting, I finally decided to give it a try a month ago. I was real worried that my hair would be oily with the “No Poo” method, but once I got the first few washes in and I adjusted the amounts of product that I needed, my hair is actually a bit less oily! If you have oily hair, they suggest increasing the amount of baking soda you use (up to 2 TB) and reducing the dilution of apple cider vinegar (down to 1/2 TB ACV to 1 cup water). If your hair is dry, you will want to reduce the amount of baking soda (down to 1/2 TB) and increase the apple cider vinegar (up to 2 TB ACV in 1 cup of water). I take the baking soda and make a paste of it, but you also can dilute it in water and apply it to the scalp. You mostly want the baking soda on your scalp and the ACV mixture on all but the scalp. 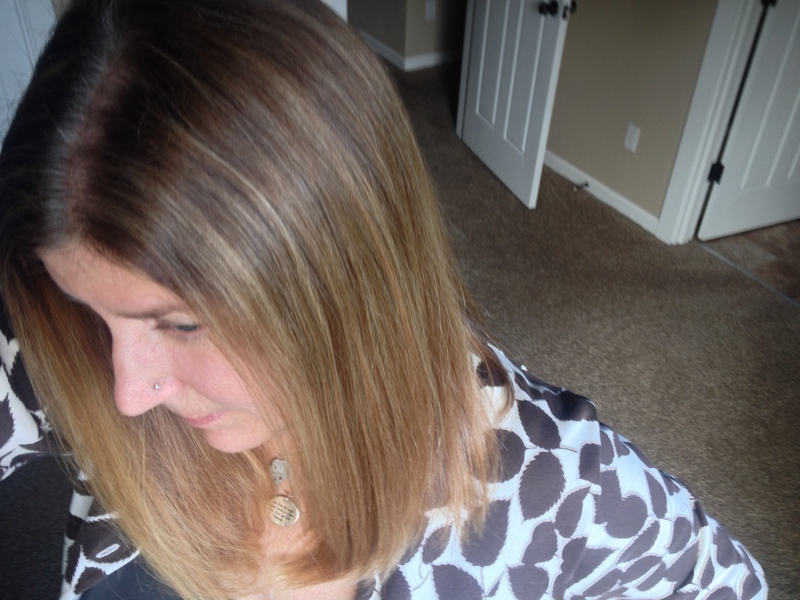 I am still using the Aveda Pre-Style to help detangle my hair and I am using a blow dryer and flat iron most days for a straight hair look. The No Poo works so well, I don’t see myself going back. My hair also takes about half the time to dry without all those chemicals sticking to my hair. This hair care change comes with a huge cost savings. I paid near $300 a year for the Aveda products. I am now paying $5 a year for washing/conditioning and about $35 a year for detangling and smoothing. My next step may be to find a DIY detangler recipe. As I was writing this blog and going back to read labels, I found myself getting angry. For those of you who know me, I don’t often get angry. I somehow bought the image they were selling that Cetaphil is good for newborns, Arm & Hammer toothpaste is just baking soda and Aveda is made from wholesome herbs and plants. But, reading the labels has shown me otherwise! Food Matters recently offered a 7 Day Skin Detox program aimed at education on the chemicals in beauty products and offering natural options for healthy skin. I highly recommend you check it out. It is important to look-up products each time you buy, as companies merge or make formula changes frequently. You want to find companies that don’t animal test and that don’t have animal ingredients in their products. Some products are easier to find on these lists, but some can be difficult to track down. I’d love to see them make their searches a bit more robust. After opening my eyes through the writing of this blog, I am now able to see that advertising is just that…advertising! It has nothing to do with real beauty. Beauty comes from being healthy, knowing who you are, being confident, real and authentic…not from your mascara. I actually had the realization that part of why I had so many beauty products, is I wanted beauty, but I felt I didn’t have it. I wanted their claims to be true, but even the best most expensive face cream can’t undo doubt, a bad diet or stress. 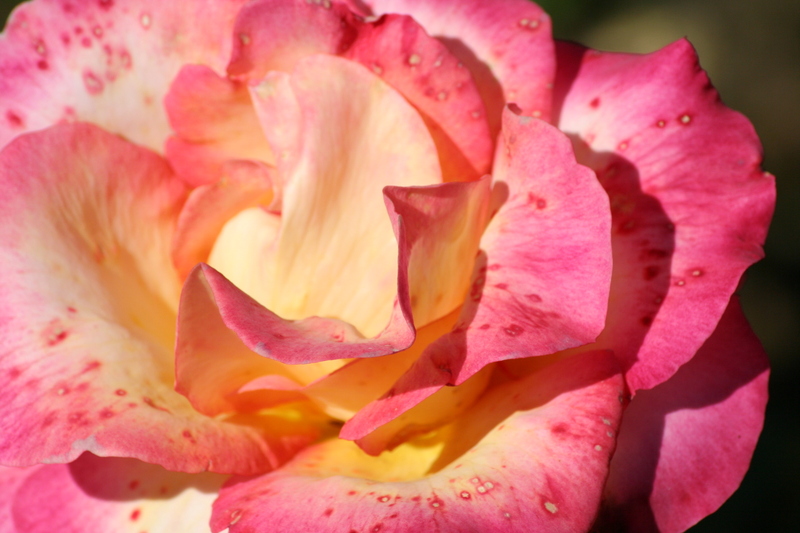 I’d like to close this blog with a letter that a father wrote to his daughter about beauty. May we all take the lesson he shares to heart. May we all know beauty comes from the inside and not all the products that pay the big advertising bucks. Let’s also wake up and ditch the chemicals while finding ways to simplify and be kind to ourselves, the animals and the planet. great post!! some new, simpler things to try! Thanks Edith. I am learning simpler is cheaper and better much of the time. Very interesting read Kathy. You have changed about everything in your life. No wonder you didn’t need any Day Wear or Lip Dew when I was coming up to see you. It does amaze me how you have carved out a basic new life for yourself. It is only 8 more more days till some more changes present themselves in your life. Enjoy and please continue to keep me posted. I do enjoy hearing about your journey. I read in the newspaper this evening that “Walking the Camino” is in Monterey at the Osio Theatre. I hope to go see it tomorrow if it is still there. I was very surprised to see it listed. Thanks so much for your support. I hope you do get to see “Walking the Camino.” Can’t wait to hear what you think of it. I am hoping me and Ron can find a location that is showing it while he is here! Thanks for the de tangling tip Jessica. I’ll have to try it.